Saints cornerback Marshon Lattimore came up with an interception of Matt Ryan late in the first half of New Orleans’ 23-13 win over Atlanta on Sunday when a deflected pass came to rest on his backside as he lay facedown on the field. The Saints cornerback came up with an interception of Matt Ryan late in the first half of New Orleans’ 23-13 win over Atlanta on Sunday when a deflected pass came to rest on Lattimore’s backside as he lay facedown on the field. 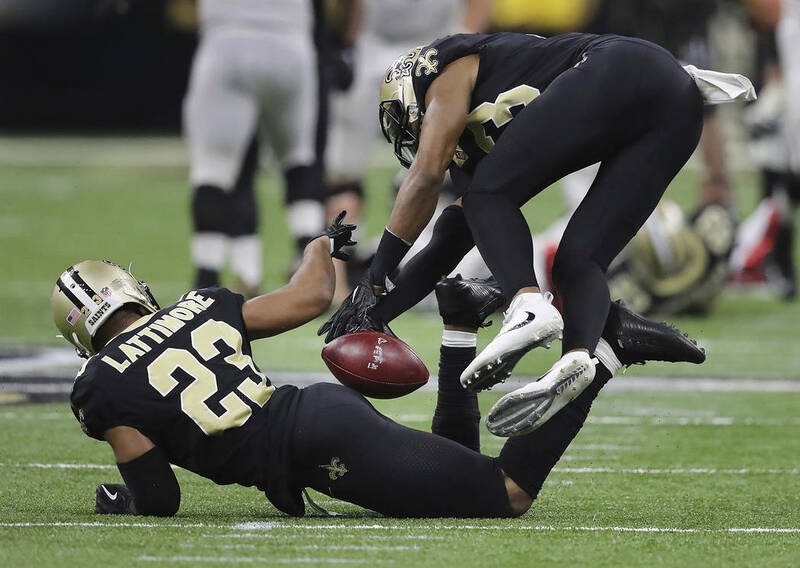 Lattimore was able to secure the ball with the help of his teammates, and three plays later Drew Brees hit Ted Ginn Jr. for a 54-yard touchdown pass and a 13-0 lead. Saints bettors called themselves winners after the improbable play helped New Orleans cover as 5½-point favorites. The Saints’ defense also delivered two goal-line stands in the second half as they dealt the Westgate sports book its worst loss of the day. The sharps were on the Falcons, but the public was on New Orleans during the slowest betting day of the NFL season. The worst game for MGM Resorts sports books was the Titans covering as 6-point underdogs to the Rams, who won 27-23. Stoneback said an MGM Resorts bettor won a wager of almost six figures on Tennessee. The books won on the day, though, thanks to the Seahawks and 49ers each pulling off outright upsets in the afternoon. Justin Coleman returned one of Dak Prescott’s two interceptions for a TD as Seattle beat the Cowboys 21-12 as 4½-point underdogs. Jimmy Garoppolo threw for two TDs and ran for a score as San Francisco won its fourth straight behind its new quarterback in a 44-33 win over the Jaguars as 4-point underdogs. A week after favorites finished 14-0 straight up (with two games closing at pick’em), favorites are 11-3 straight up (7-6-1 ATS) in Week 16, with the Bengals recording the other upset in a 26-17 win over the Lions as 3-point underdogs. “We’re seeing a lot more people wagering on the money line and money-line parlays than we do on the point spreads,” Westgate sports book manager Jeff Sherman said. Double-digit favorites went 2-1 ATS on Sunday. The Pros beat the Joes when the Buccaneers covered as 10-point underdogs in a 22-19 loss to the Panthers. But the betting public won on the Patriots, who covered 11 points in a 37-16 win over the Bills, and on the Chiefs, who covered 11 in a 29-13 win over the Dolphins. Westgate SuperContest leader Grannys Boy went 5-0 on Sunday to improve to 55-20-5 with one week left in the world’s most prestigious NFL handicapping contest. Grannys Boy had the Titans, Buccaneers, Saints, Chiefs and 49ers. With a record 2,748 entries, the winner will earn more than $1.3 million. Stoneback said the Pros and the Joes are both on the Eagles, who are favored by as many as 10 points over the Raiders on Christmas Day after opening as 8½-point favorites. In addition to Monday’s NFL doubleheader, there’s an NBA quintuple-header starting at 9 a.m. and ending around 10 p.m. The Warriors, without Steph Curry, are 5-point home favorites over the Cavaliers in a rematch of the last three NBA Finals. The disappointing Thunder are 2-point home underdogs to the high-powered Rockets, who will be without Chris Paul. “To me, that’s the best game of the day,” Sherman said. “Houston’s coming off two bad home losses to the Lakers and Clippers. This will be a big game for Oklahoma City, as much as they’ve struggled. The Celtics, 5-point home favorites over the Wizards, have the league’s best ATS record at 22-12-2. Cleveland has the worst ATS mark at 10-22-1.